Editor's Note: This is the third article in a three part series. Part 2 discussed several common attacks from the front against someone seated in a wheelchair. Part 1 discussed self-defense responses to a push from behind. This article, and the others in the series, was the result of being confined to a wheelchair for a period of time, an experience which gave me a better understanding of the martial arts as well as an appreciation for those who are handicapped. I realized also that while some "attacks" are unique to those in wheelchairs, others are similar to those experienced by anyone sitting in a chair, on a bench, on a train or subway, or on the floor. In studying self defense techniques for those confined to wheelchairs, I was surprised at the number of defenses that I recognized as coming right out of the karate kata I had practiced for so long. This article discusses how to defend against attacks from the side, where the attacker is usually trying to restrain the person, or tip the wheelchair. Often there is insufficient time to use seemingly complex defenses, so presented here are a variety of defenses, both simple and complex. Defense Technique 1: By far the simplest technique is a crane head strike (back of wrist) or a rear crane beak strike (finger tips) to the knee, or groin (here shown), depending on where to the side your opponent is standing. Here the defender is sitting in a chair to show the similarity of defensive techniques that can be applied to someone sitting in a wheelchair or in a standard chair. The inside of the thigh, just above the knee, is one of the most sensitive areas for a crane beak strike. If he's close enough, an elbow to the knee can also be devastating. 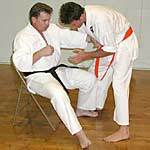 Pinching the inner thigh near the groin area usually causes the opponent to back away very quickly as well. Defense Technique 2: An attack comes from your right side. Here again, as the attacker reaches for you with his right hand you can counter with a crane head strike (back of wrist), a rear crane beak strike (finger tips) to the knee, or groin, or pinch to the inner thigh. As the person responds, hook your right arm under the opponent's right elbow while also grabbing his wrist with your left hand. Now pull with your right arm and push with your left to turn your opponent so he falls over your lap. Defense Technique 3: Another response to a potential attack from the right side is to initially respond as in #2 above. In this case, however, as the person bends forward, reach up with your left hand to grab the back of his neck (or hair) and pull him forward toward your lap. As you do this allow your right hand to come up under his throat. Your left hand can then grab your right wrist to affect a choke. Defense Technique 4: In this defense as your attacker is reaching toward you with his right hand, intercept and grab the arm with your left hand while also executing a right palm heel strike to the opponent's groin. Immediately move your right hand between your opponent's legs and begin to lift and pull your opponent towards you using both arms. The attacker will end up lying across your lap (here shown from the side).